One of the signature initiatives of the 125th Maine Legislature was passage of a comprehensive health insurance law. The new law's enactment in May of 2011 changed fundamental components of Maine's health insurance statutes, and it provided a significant victory for the new Republican majority. It also provided Maine's health insurance carriers with a policy that they had long sought. 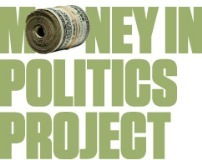 This report examines the political donations by healthcare interests over the ten year period leading up to the new law's enactment. More than $1 million dollars were spent on contributions to candidates and political action committees (PACs) by those with powerful financial interests in both health insurance and health care. Health insurance interests — brokers, carriers, and individuals affiliated with them — are familiar players in Augusta, employing the state's most prominent lobbyists. Together they provided 35% ($389,227) of the contributions examined in this report. They have historically been reliable donors to both privately funded candidates and legislator-controlled PACs, and this study confirms that industry giving was directed to both major political parties. This report reveals that the single company with the most direct financial interest in Maine's insurance regulation laws dramatically changed its giving pattern just before and after the passage of the new law. 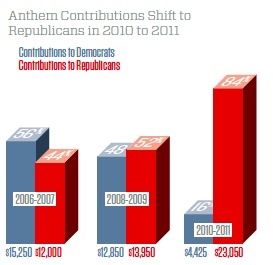 Anthem/Wellpoint not only gave more than all other health insurance carriers combined ($154,656), but it directed a startling 84% of its donations to Republicans in 2010 and 2011, a significant departure from the balanced giving evident in previous cycles, and coinciding with the Republican takeover of the Maine House and Senate. The new law addresses two longstanding pillars of Maine's health insurance system: guaranteed issue and community rating. The new approach allows health insurance carriers more flexibility and imposes fewer requirements on their business practices. While supporters tout the benefits to business and consumers, opponents warn that the law will lead to dramatic inequities in access to health care among demographic and geographic groups in the state. As individual elements of the law are implemented, the wisdom and impact of the law will be revealed and debated anew. Since access to health care along with the cost and quality of care is of interest to every Maine business, family, and individual, and since health care spending is a significant portion of the state's budget, it will remain a salient issue in elections and in future legislatures. This report's scrutiny of campaign donations from the health care industry to Maine candidates and PACs does not imply that any illegal activity has taken place. Its purpose is to shine a light on how a pool of money from an important industry sector was deployed in Maine elections over a period of ten years, and how that money may have paved the way for industry-desired reforms.